After some obligatory sake shopping and a much-needed nap, we dragged our asses out of the comfy bed at the Palace Hotel Tokyo and made the short trip to Ginza. The Dining Austrian had chosen a small izakaya (居酒屋) on the recommendation of none other than Little Meg, so I was more than a little curious about Ritei Sanbun (離亭 三ぶん). 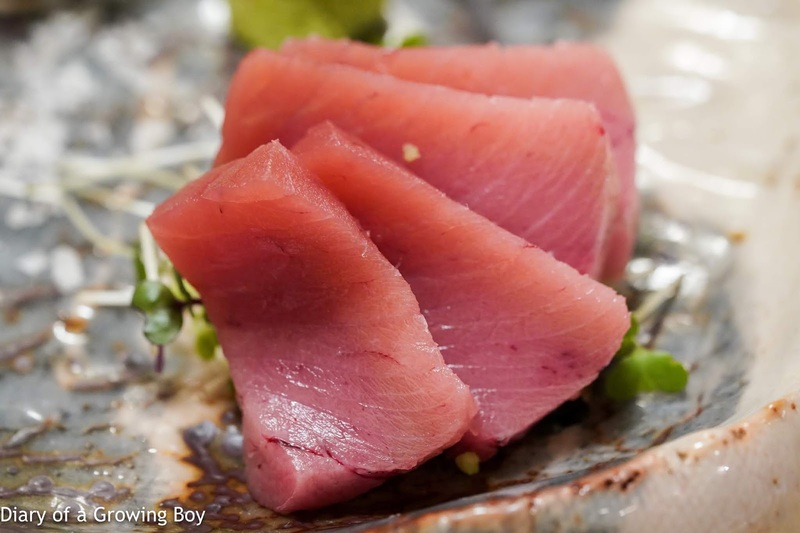 Japanese tuna (本生マグロ), from Aomori Prefecture (青森県) - this came from the waters around Japan, and we were asked to take it with sea salt and mustard and not soy sauce with wasabi. 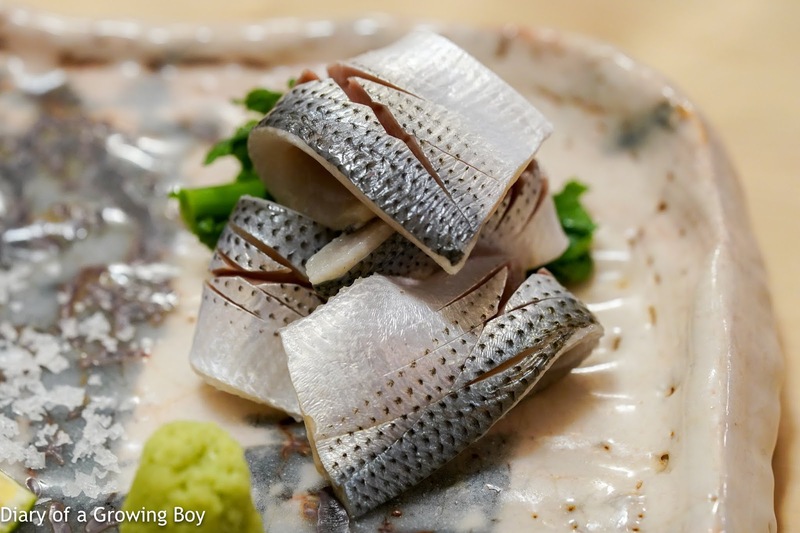 Gizzard shad (小肌), from Saga Prefecture (佐賀県) - pretty nice and fatty, without too much vinegar. 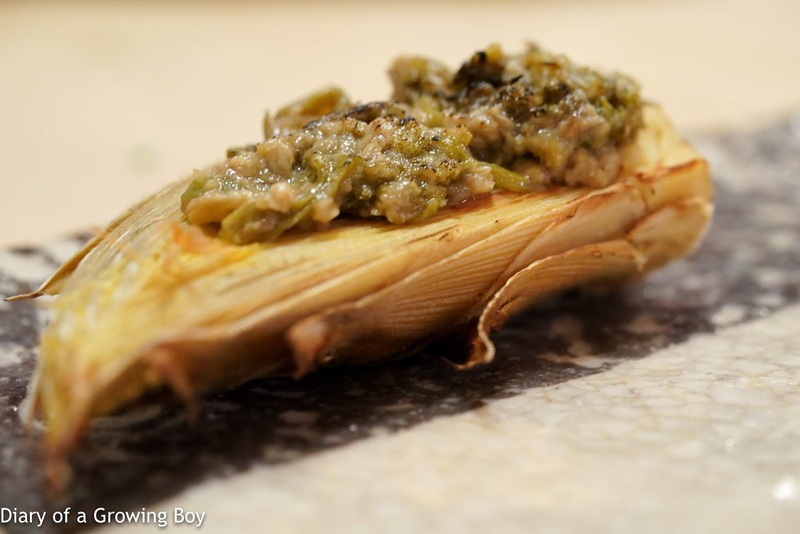 Striped beakfish (活石鯛), from Chiba Prefecture (千葉県) - we were asked to use the irizake (煎り酒) instead of soy sauce. I had never heard of irizake until now, but apparently in the old days when soy sauce was expensive and unaffordable to many, irizake was the seasoning for the masses. 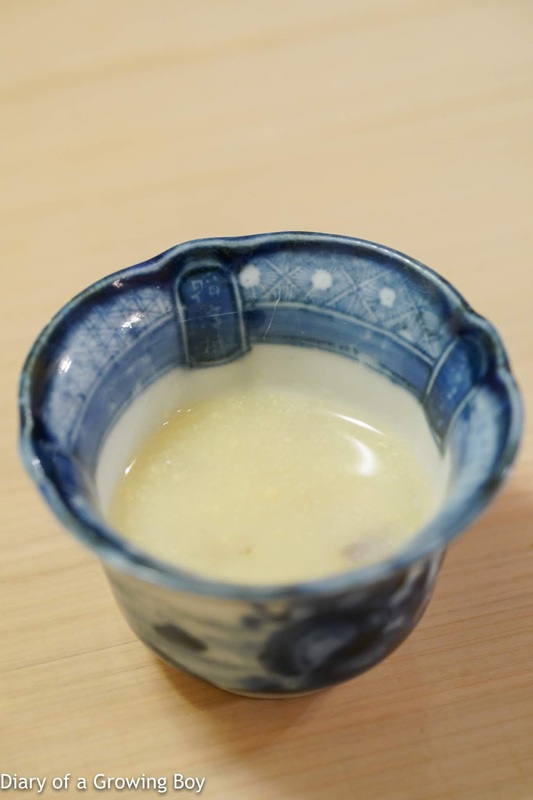 This is made by simmering sake with ingredients like katsuobushi (鰹節) along with other flakes, and I could definitely taste the saltiness and umami of the bonito. 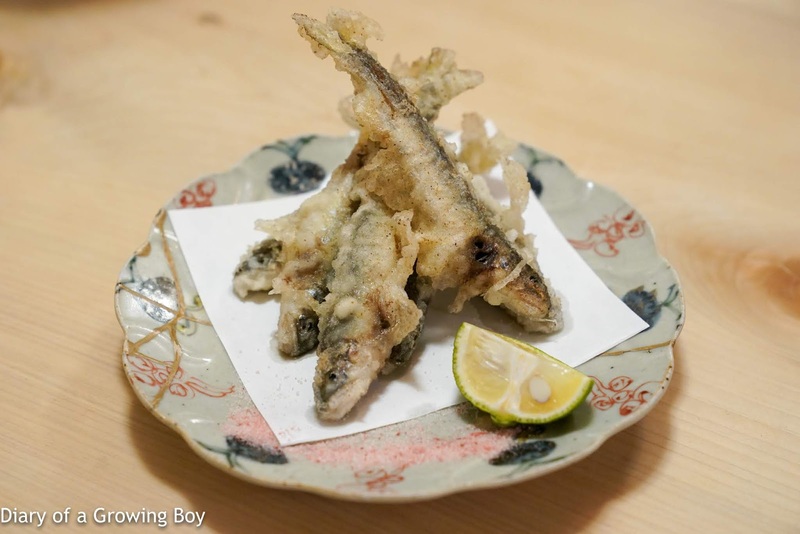 Sillago sakura tempura (キスの桜天ぷら) - the sillago fillets were lightly battered together with cherry leaves and deep-fried. 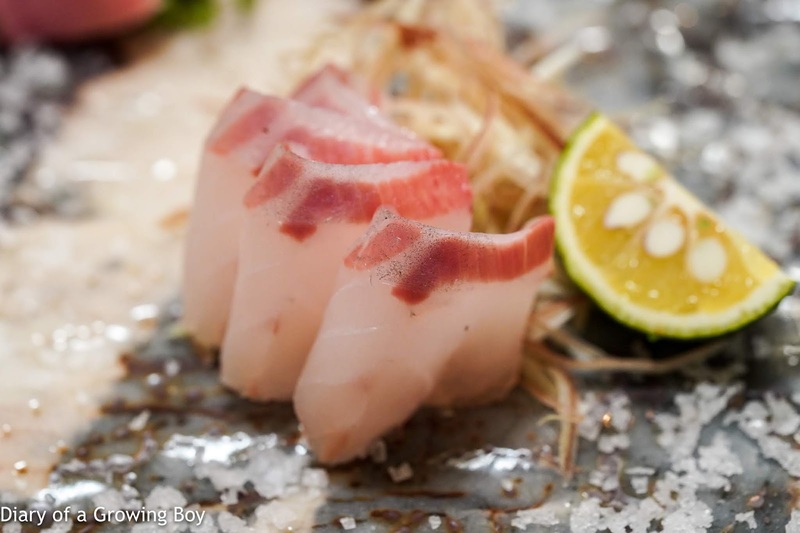 Served with sakura salt. 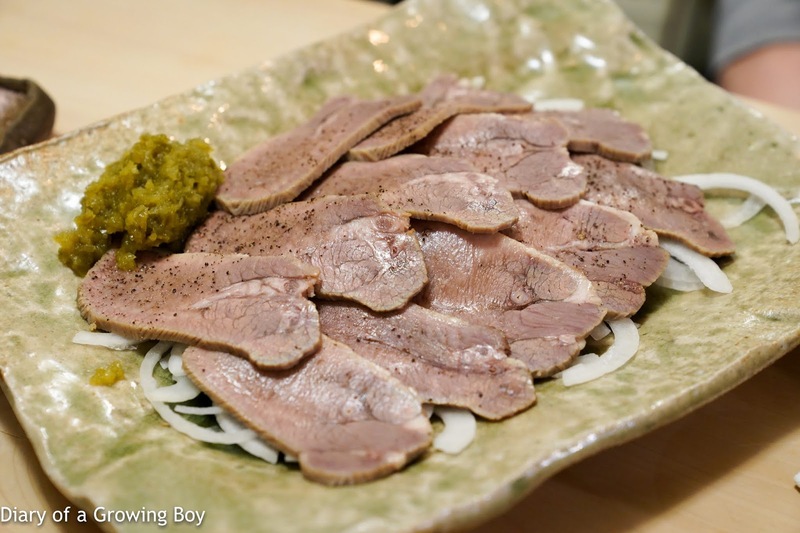 Torched beef tongue (炙り牛タンくん) - served with homemade yuzukosho (柚子胡椒) and raw onions. 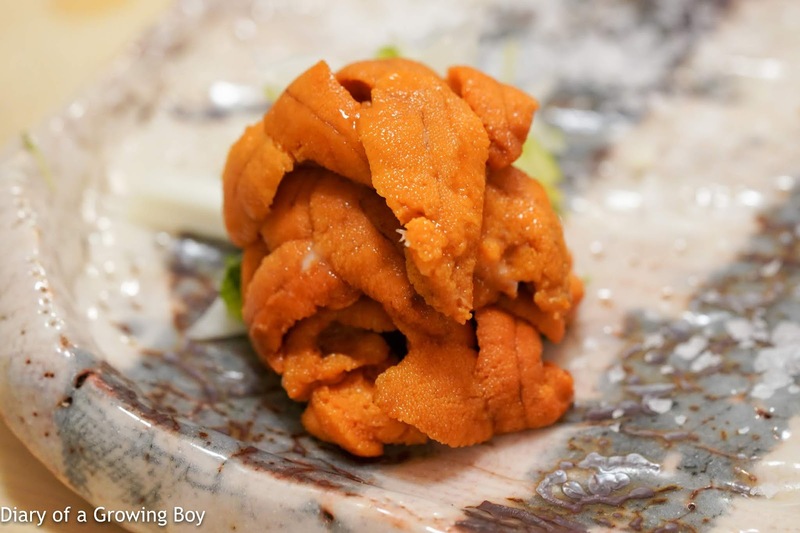 General consensus was that we would have preferred this to be more raw, as fully-cooked tongue - which happened to be a little more salty than I liked - just wasn't that interesting. 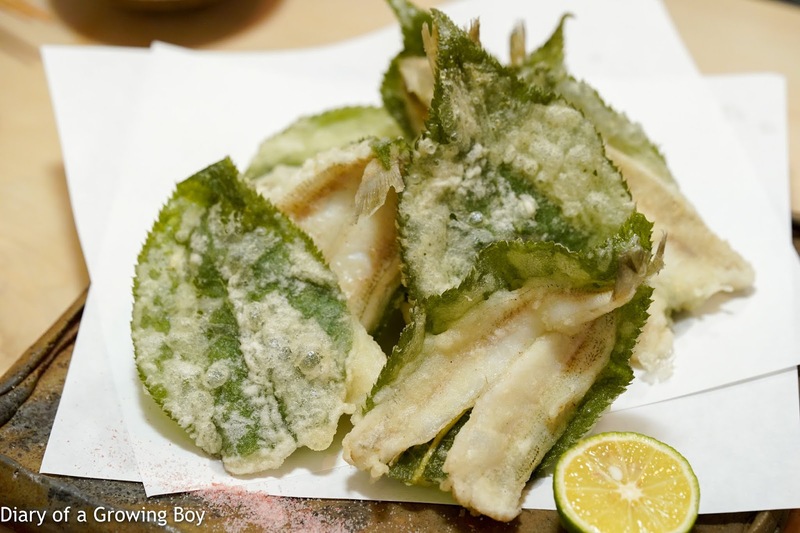 Baby sweetfish tempura (稚鮎天ぷら) - yum. I could have used a few more of these. 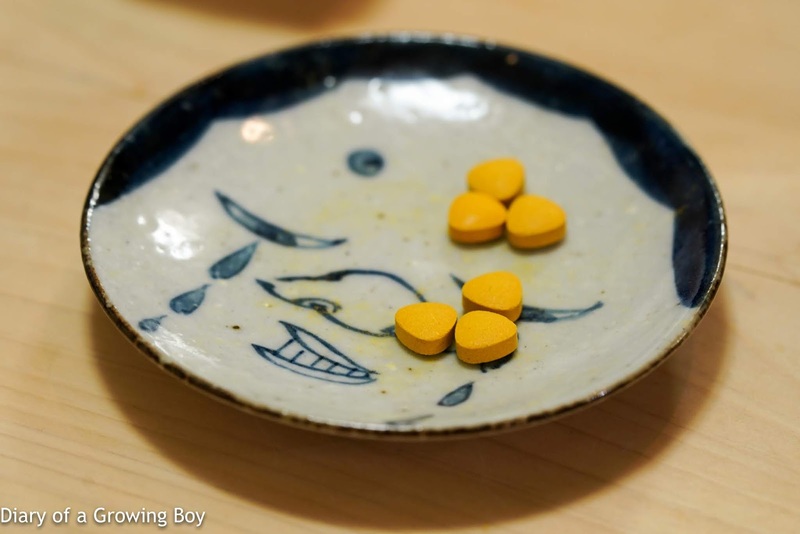 Also served with sakura salt. 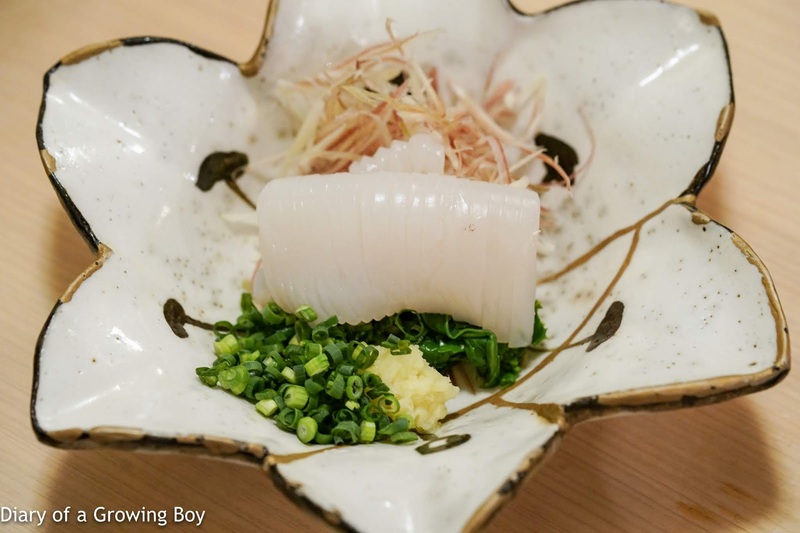 Squid somen with shottsuru (三ぶんのしょっるイカそうめん) - when I saw this on the blackboard, I was imagining long, thin strands of somen (そうめん)-like squid. So when this arrived and I saw that the squid had been cut across horizontally and it was more the thickness of soba (そば)... I felt a little disappointed. To be honest, I was only disappointed because of how jaded I am. After all, I've been around the block a few times and squid noodles are nothing new for me. Hey, I've had a version done by Rene Redzepi! Grilled bamboo shoots with butterbur miso (筍ふきの味噌焼き) - the bamboo shoots were OK, and the miso came with the distinctive flavors of butterbur (蕗). Sea urchin cream croquettes (ウニクリームコロッケ) - surprised to find kidney beans inside the croquettes. These were certainly creamy and liquid inside, but flavor-wise they were just OK. 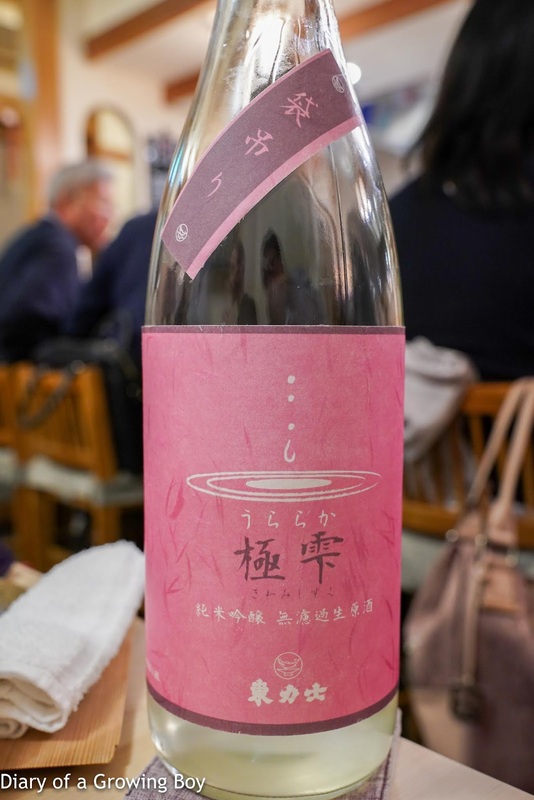 This being an izakaya and all, I decided to order some sake... but since we had another stop to make after dinner, I kept it very civilized and only ordered one go (合) each. 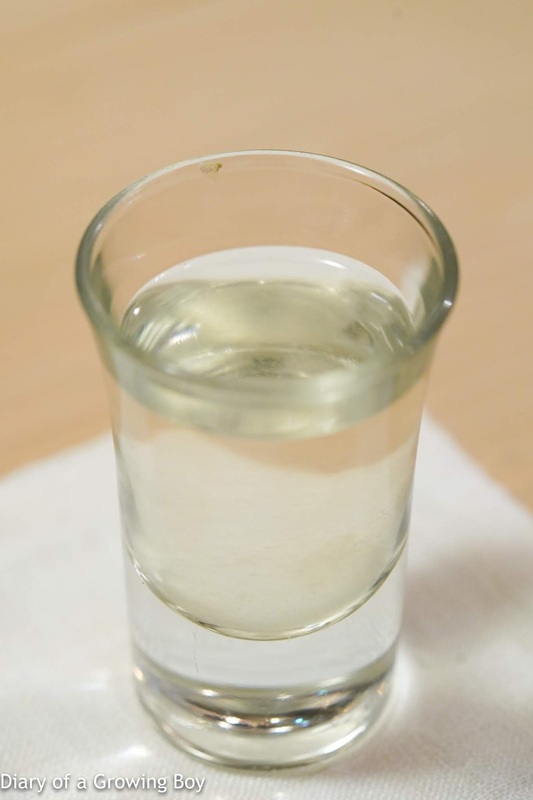 Nanbubijin Tokubetsujunmai Unfiltered Unpasteurized (南部美人 特別純米 無濾過生原酒), from isshobin - with a seimaibuai (精米歩合) of 55%. Sweet mid-palate with some acidity on the finish. 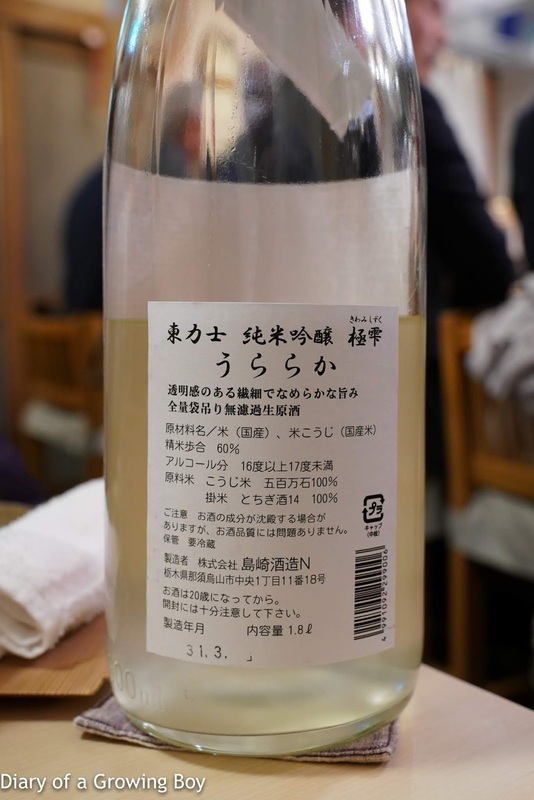 Azumarikishi Kiwamishizuku Junmai Ginjo Unfiltered Unpasteurized Uraraka (東力士 極雫 純米吟醸 無濾過生原酒 うららか), 30BY, from isshobin - with a seimaibuai (精米歩合) of 60%. 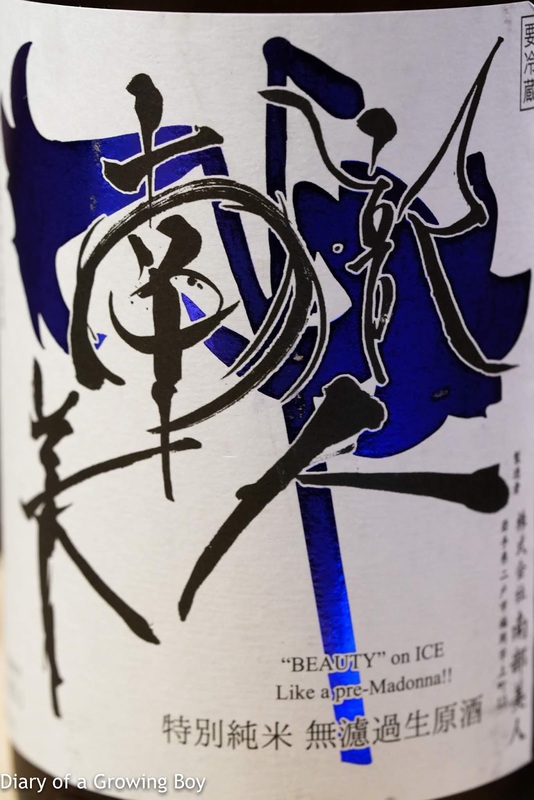 Very rich with good depth of flavor. Dry and spicy.